To say the creation of MountainBased is unique would be an understatement. You wouldn’t expect three brothers and a cousin, who grew up in small town Iowa, to come from a family of renowned adventure travel pioneers. We spent our childhood traveling to some of the world’s most beautiful and iconic places. We grew up hearing first hand stories of outdoor legends such as Paul Petzoldt, Harvey Carter, Hans Gmoser, and Fred Beckey. First ascents, new routes, and ‘youngest to’s’ were common taglines as our grandparents and parents summited peaks around the world. Throughout our house lie remnants from these adventures; rusty mountaineering equipment, dusty slides, and aged journals engulf the garage as constant reminders of past explorations. Our grandparents, S. John and Ede Ebert, were accomplished climbers who in 1940 founded one of the most prolific climbing and mountaineering clubs in the world—The Iowa Mountaineers. These trailblazers summited over 1,300 peaks and guided over 75,000 participants across the world. Our family’s organization was responsible for naming numerous mountains in the western United States, most notably in the Sawtooth Range of central Idaho including Mt. Iowa, Warbonnet Peak, Mount Ebert and Mt. Ede. On July 26th 2011 our dad died of complications from an enlarged heart while hiking Mt. Whitney to scout out the next great adventure. For those who knew him, he will not be remembered solely for his long list of accomplishments. Rather, he will forever be remembered for his uplifting spirit and the way he inspired us to always pursue our dreams, no matter how high the climb. Same Family. New Company. Refined Experience. 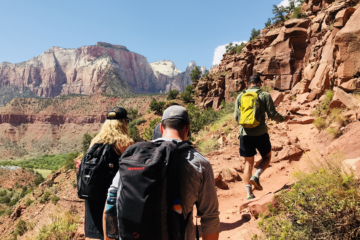 Inspired by our past and in memory of our father, MountainBased came into creation in September of 2016 and is now offering hiking and camping trips throughout the American Southwest. It is our dream to build a business that inspires you to take the next step to living a life outdoors. We want to be that push that gets you to experience the places you’ve always wanted to, but just didn’t know how to start. 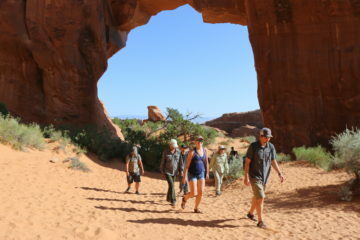 As your guides, we make it easy for you to immerse yourself in the beauty of our National Parks—and if you’re up for the challenge, find out just what you are capable of. We would like to thank our enthusiastic community of the past, present, and the future. This includes The Iowa Mountaineers, The University of Iowa, and several other organizations that propel adventure travel, outdoor safety and stewardship. Here’s to living a life in the mountains and having the courage to pursue our dreams. *Adapted from an article written for Rock and Ice Magazine by Adam Tillinghast. See the original article here. Would you hike Angels Landing?